EVER since Lawrence Hargrave began flying his box kites, Bald Hill has been an iconic site for visitors and a defining area for flight and gliding. Bald Hill now attracts more than 3,000 visitors in peak times and about 900 visitors each day on average. The Hill has helped to define the northern beaches of Wollongong and will continue to provide sightseers, photographers, and visitors with majestic views of the sea cliff coast. 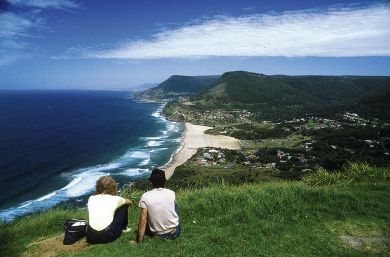 In a move that now lays the ground work for upgrades to the site, Wollongong City Council has endorsed a Landscape Masterplan for the iconic Bald Hill at Stanwell Park. Wollongong Lord Mayor Gordon Bradbery said Council has engaged and listened to many different points of view through consultants. “Council has adopted the new masterplan which will provide a pathway for Council to bring this beautiful site and lookout up to a better standard,” he said. “We are seeing about 3,000 visitors each day during peak days,” he said. “The masterplan will help us to increase car parking for 86 cars and four bus parking spaces. “Council will be able to stage works on the site so that we create an iconic lookout that will remain for years. The masterplan also takes into account future aspirations and will provide Council with an agreed direction for the site that Council can then discuss with community members, local organisations, and other state agencies. “I’m more than happy with the masterplan and look forward to seeing this site become a beautiful northern welcome for visitors to our city, Lord Mayor Bradbury said. Realignment of Lady Wakehurst Drive / Otford Road to allow the construction of a round-a-bout at the Bald Hill Reserve entry and bus parking bays. Provision of a lower car park near the intersection of Lady Wakehurst Drive and Lawrence Hargrave Drive. The amenity block remains in its current location and the upper car park regraded to provide equitable access. Construction of a pedestrian plaza around the Lawrence Hargrave Memorial and pedestrian connection to the new lower car park. Food van to remain in its current location and an enlarged pedestrian plaza space is provided to connect with the new bus parking and allow greater movement around the food van. The masterplan also ensures that the current toilet block and septic facilities are removed and make way for a new ‘low key’ toilet block with connection to sewer. Disabled toilet and parent room facilities are to be included to service the wide range of visitors and families. Parking capacity has been increased from 72 spaces to 86 spaces, including four bus parking spaces along Lady Wakehurst Drive. It is proposed that the northern car park will be regraded to allow disabled access to the new toilet block and four disabled spaces. For more information you can contact Council’s Customer Service on (02) 4227 7111 or visit Council’s website.